One of the more memorable pieces in the inaugural Made in L.A. Biennial of 2012 was at the Barnsdall Park location, an installation based on casino architecture of oriental carpets, darkened mirrors and flashing lights by Cayetano Ferrer. 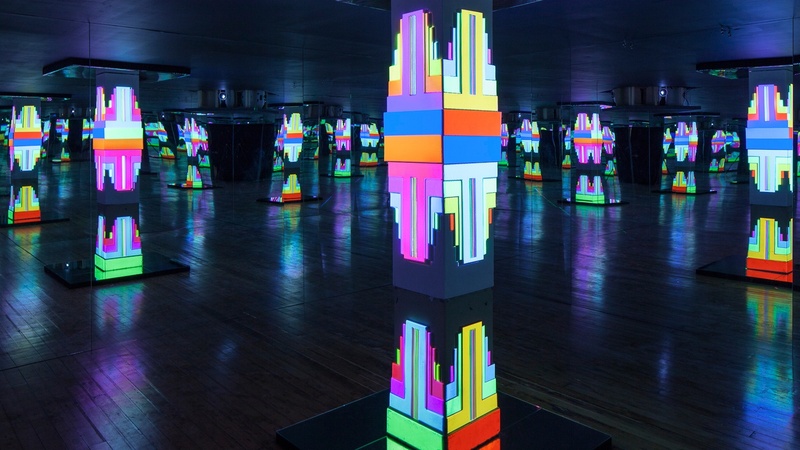 Ferrer’s most recent Composite Arcade is on view at a new gallery downtown, Chateau Shatto through Nov. 1. Having completed USC’s graduate program, Ferrar lives here but spent his teenage years in Las Vegas, which he views gimlet-eyed as rich source material literally and symbolically. The seductive, manipulative aspects of casino architecure are selectively redeployed in his immersive installation Endless Columns (2014). 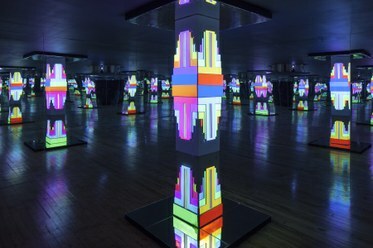 An extremely darkened space is lined with mirrors and illuminated only by the colored lights arranged to systematically build the appearance of columns, using a shape based on an ashtray from the MGM Grand. It is a room that appears to build itself with a low thumping sound track that emulates both heart beats and slot machine clunks. The effect is mesmerizing, familiar and slightly addictive. The show also includes sculptures of recycled marble from the frequently remodeled casinos. 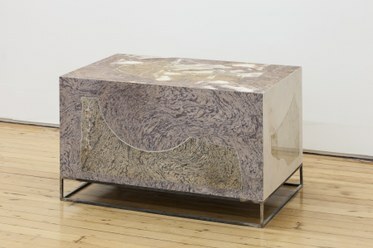 Using a single uneven scrap, he uses computer programs to generate matching surfaces made of synthetic marble to produce rectangular blockish forms recalling both minimalist art and hotel bathrooms. 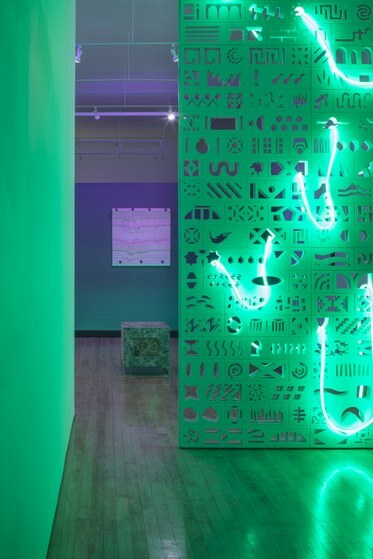 Infinite Screen Wall (Vertical Section) is an artificial tile wall perforated with spirals and triangles and other symbols vaguely reminiscent of logos and entwined with a long loop of electric green light. It demonstrates they ways in which he can extend his thinking to architectural elements endemic to other locales, especially L.A. Laying bare the elements by which desire and comfort are manipulated through tropes of modern design, Ferrer engages while opening our eyes to deeper complexities. 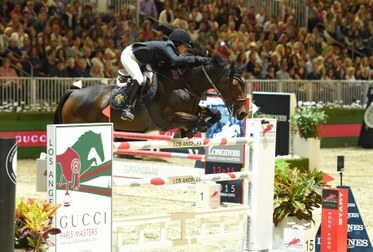 For details, go to chateaushatto.com. Then I headed down to 356 S. Mission Road to check out progress on 590 Dots, a wall installation in process by New Yorker Jonathan Horowitz. 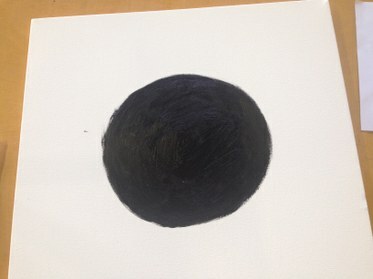 I found myself agreeing to paint my own dot, actually an 11-inch circle in an 18-inch square canvas. Brushes and paint are provided so I did my first painting since art school. It very soothing indeed and I was surprised to be given a check designed by the artist for $20 — the going rate for all participants. I call that time well spent. 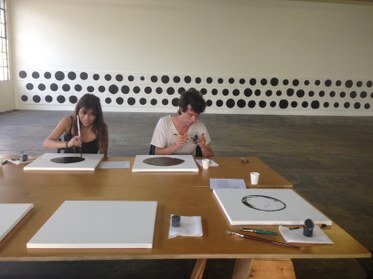 More dots are needed until the wall is completely full so you, too, can add your bit to a work of art through Oct. 18. For details, go to 356mission.com.